All our trips are planned well in advance at least 3 months prior to the travel and all the necessary bookings are done. In the month of December 2014, I was not sure of vacation and could not do any arrangements. Finally we decided on Goa but not sure of availability of accommodation as it is the month when tourists arrive in the state. After some frantic calls we could arrange stay at temple guest house. On 23rd December we left Bangalore early morning by a car. As the roads were good we covered a distance of 550 Kms to reach Goa border within 7 hours. 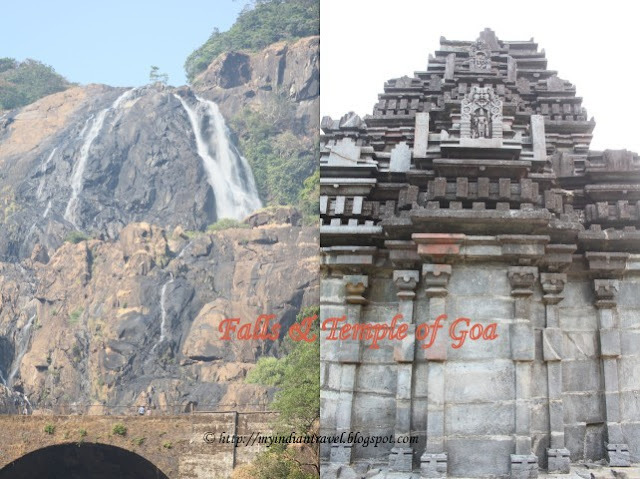 Our first stops in Goa for the day were Dudhsagar Falls and Tambi Surla Temple. We proceed further and reached our temple accommodation in Ponda. Next day, we ventured on the tour of several temples in the area. On the third day we we planned to tour the churches of Old Goa. But unfortunately at Basilica of Bom Jesus Church was too much crowded as people had gathered there to see the mortal remains of St. Francis Xavier which was taken out and on display for the three days. But for my surprise I could see only Indians in the queue and there were no foreigners. 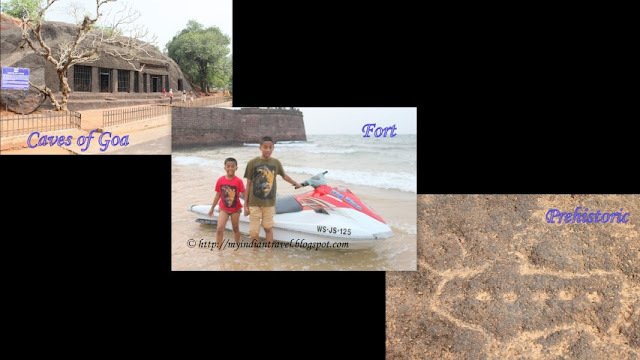 Finally next day we visited caves, beaches, forts, prehistoric Usgalimal rock engravings before returning back to Bangalore. Best part of the trip is that we enjoyed the entire trip even though it was decided only 2 days prior to the actual travel. We touched upon all: temples, churches, beach, fort, prehistoric engravings, caves, sanctuary and water falls in a short span. It's must be so much different to stay at temple guest house. Hello, sounds like a busy vacation with lots to see and do. The waterfalls is gorgeous. And I think the boys love the jet ski. Have a happy day! What a fabulous spot...so many churches, temples and history....and I think I spy marigolds adorning that steeple. What a long journey for just a couple of days but you certainly made the most of your time. Did you find time to sleep at all? I remember going to Old Goa. It was beautiful. That looks like Fort Aguada near Calangute? Goa is one of my must see spots in India. I hope that I could make it with God's grace. Oh, what a wonderful trip indeed, Rajesh!! I really like your captures!! Thanks for sharing the fun as always!! glad you enjoyed the trip and were able to visit all places in a short period of time. What great shots of this fun trip! Unplanned trips often become the most memorable ones! 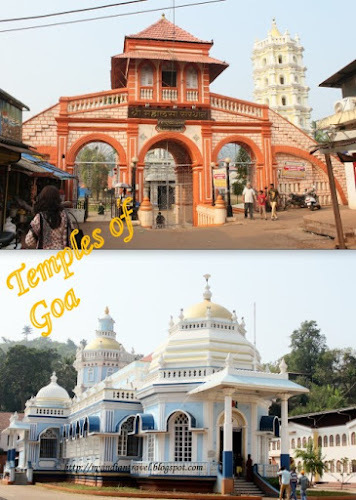 Nice photos, I love the Temple Goa! Sometimes spur of the moment is more fun than what you plan carefully. It's harder to that with kids though, because of course they aren't as flexible about eating and sleeping , so we always planned back when we were young like you, with family. Now we often decide suddenly to take a short trip. Whatever happens is fun when you have no expectations! Staying in a temple guest house must be a unique and wonderful experience. A most interesting trip, for you and for your readers! A few months ago, I read a mystery that was based in Goa in the early 20th century. So, seeing your photos is especially cool. It fills in the things I could not imagine as I was reading about what the temples looked like. I love those trips that are planned and taken on short notice - always an adventure without too many expectations! Great post! You sound quite enjoyed the trip! Hope u write more about the places u visited in detail... Beautiful photos and I liked the architecture of the temple. unplanned trips can be fun. I made an unplanned trip last wed, flew on Thursday and came back on Sunday. hey this blog post of yours is a complete guide tour for GOA. I have been there for many times & every time i just enjoy the place. That's was i use to plan Goa Tours yearly. And this time i am planning for international holidays form India. Is the second photo a Dudhsagar falls? Looks that you and your family had a nice time there even though unplanned. Very nice write up with beautiful pictures. at basilica , St . francis Xavier's body is open for public once in 10 years . back it was in 2004 and now in Dec.2014. I have written about it in a post "Mummies in India". That second pic of the temple in white looks so beautiful, which temple is that? Good to know there is more than beaches and churches at Goa. Graet shots Rajesh !It is a Wonderful place ..